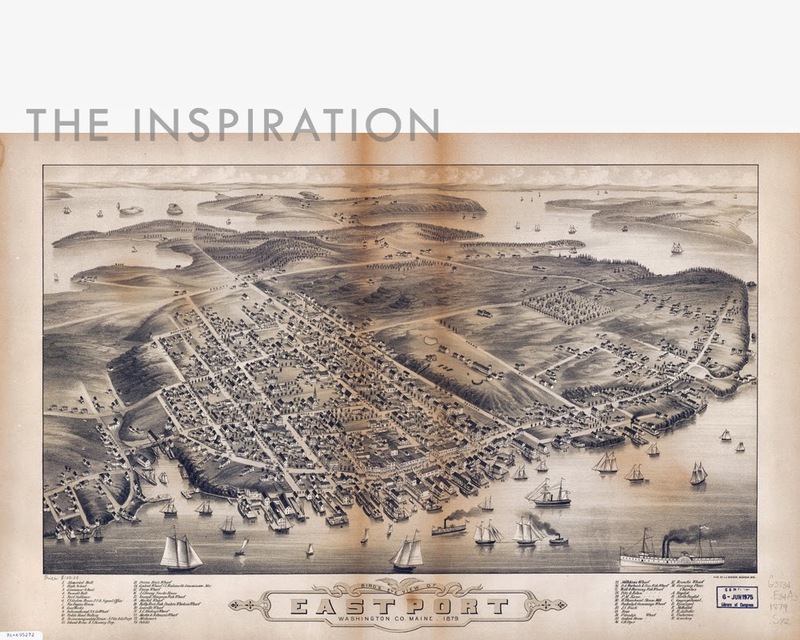 Eastport is the northernmost port on the east coast of the United States. A history of shipping, shipbuilding, packing and canning made this town in the 19th and early 20th centuries. Its preservation and revitalization as an arts and culture point as well as a growing port again is being catalyzed in the 21st century. As part of this movement, I was hired by the Tides Institute & Museum of Art to celebrate the town in an historic mode of representation - and, as it turns out, using a modern technology. 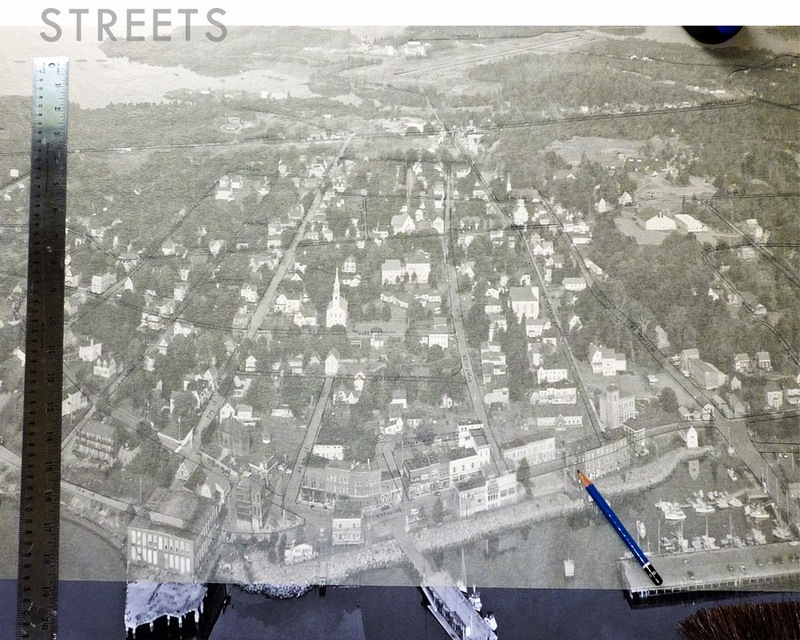 This is how the Bird's-Eye-View Drawing began. 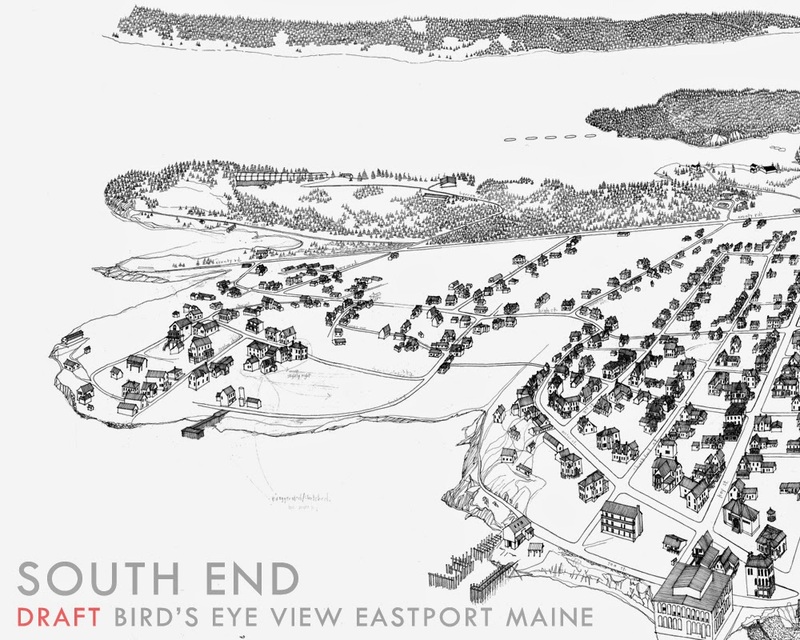 I cobbled together three different aerial photographs of Eastport, carefully, to ensure the drawing would include specific areas and landmarks. This is not how they made Bird's Eye Views in the 19th century! 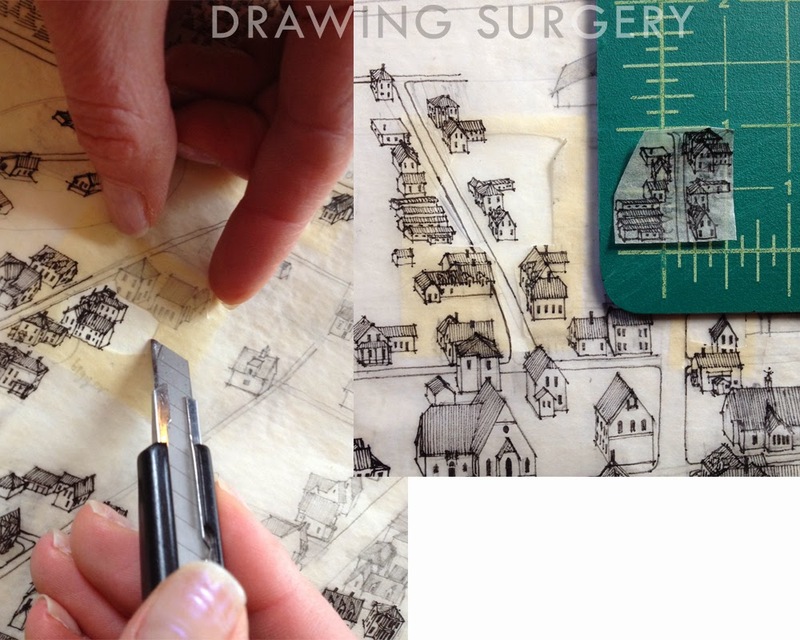 A large sheet of tracing paper served as my drawing surface, allowing me to see through to the aerial underlay. 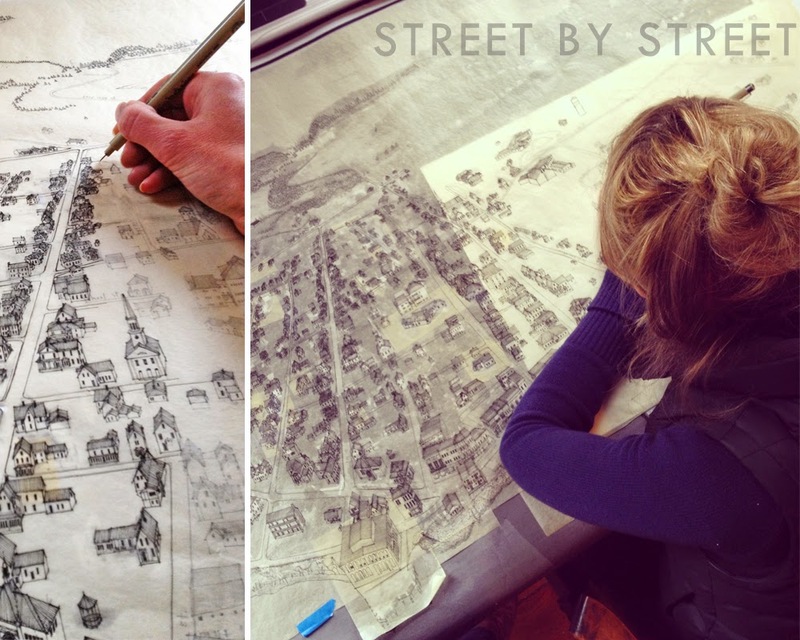 I began by drawing the visible streets, using a streets & lots map to infer the portions not visible. This was much more difficult than it may seem, due to the inherent distortion of the photograph. 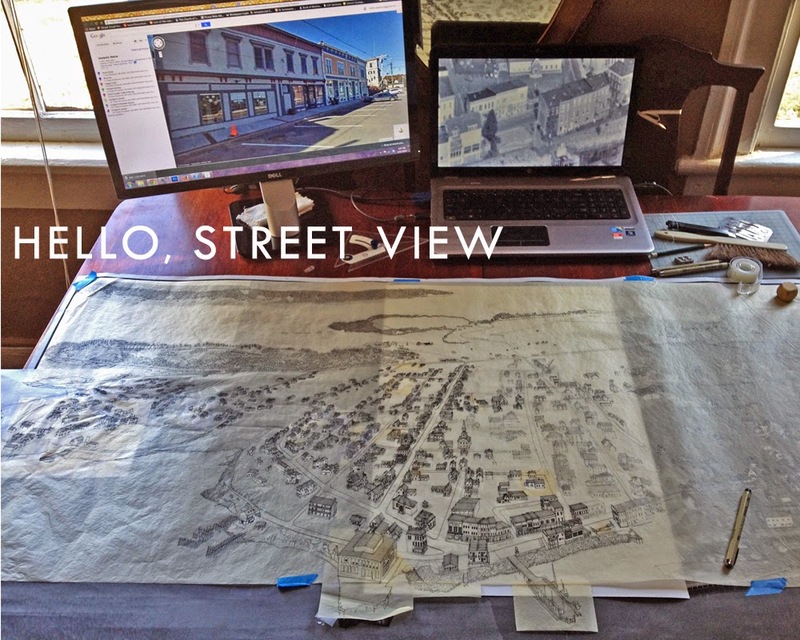 Back and forth between the Museum and me, and in the summer of 2012 I completed the Streets of Eastport and began experimenting with how best to draw the architecture. 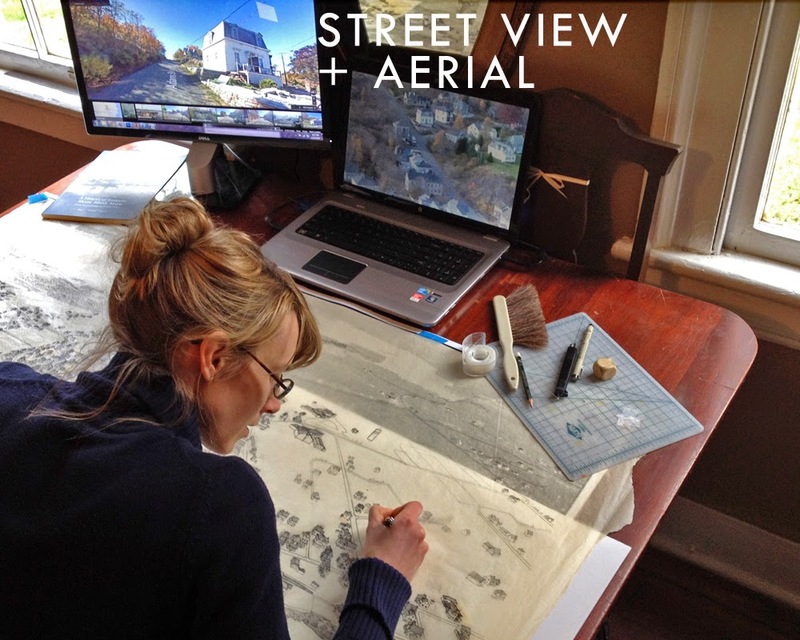 During the summer of 2013, I drew in pencil all the building visible in the aerial underlay. Over half were obscured by trees. Sometimes, I kind of guessed. 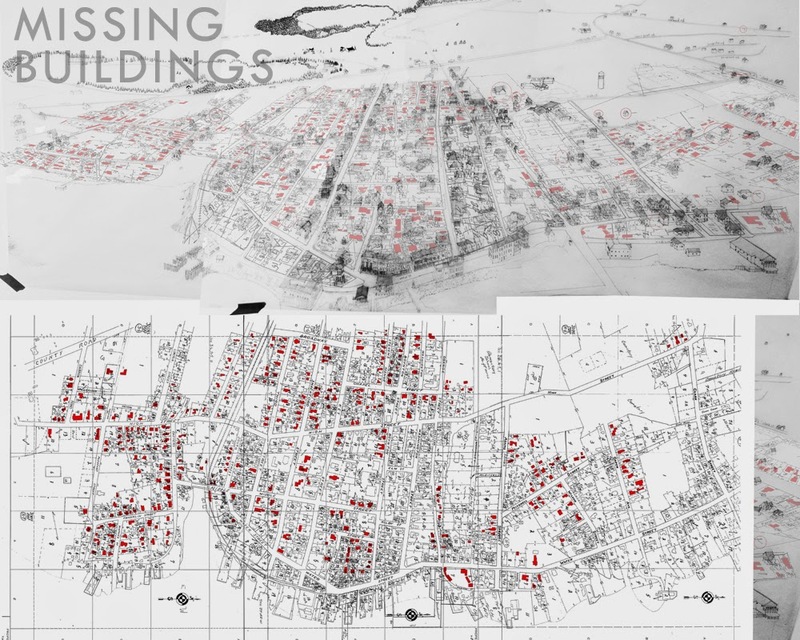 At the end of the summer, I compared my drawing to a tax map with building footprints and marked, in red, all of the buildings missing in the drawing. Yikes! Some of these were no longer standing, but most were. I waited for further images - or a trip to Eastport. The impetus to begin again in March 2014 was a batch of aerial photographs sent by the client to help me fill in the many missing buildings. 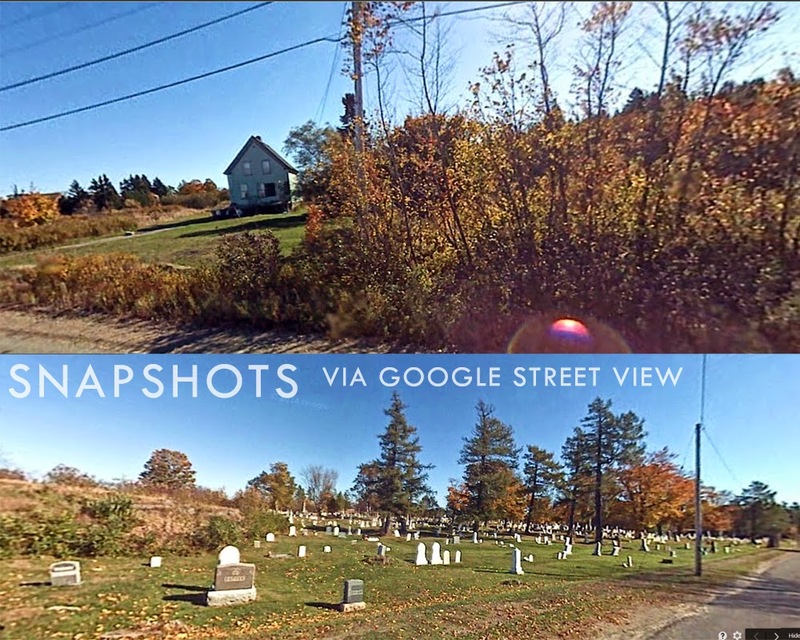 A stunning surprise was that Google has canvassed the town the preceding autumn and Street View was now available for Eastport! I could compare my aerial underlay with Street View images for greater detail and to see the missing buildings shrouded by trees in the aerial underlay. 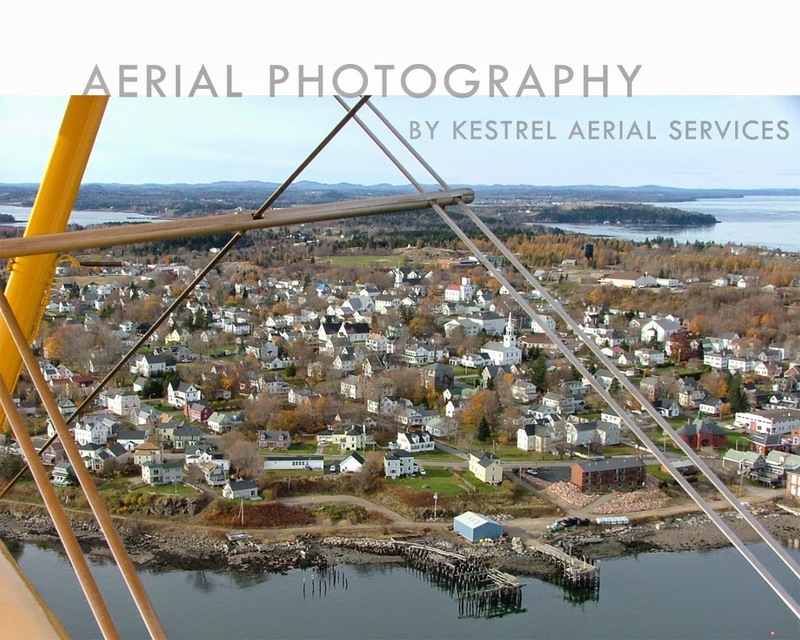 The dynamic duo of Kestrel's Aerial Photographs and Google Street View allowed me to walk down the streets of Eastport, virtually, drawing the buildings in perspective as I went. Filling in the many missing buildings, correcting the buildings penciled in last summer. The Aerials provided a great overall context. Sometimes buildings were obscured in Street View and the Aerials were essential for facade details, as well. And so I drew, block by block, street by street. 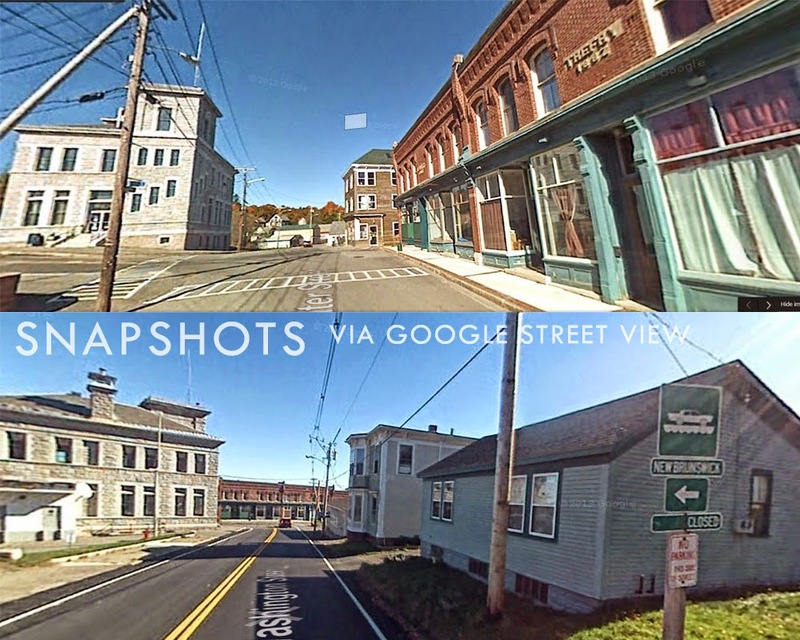 I really loved seeing Eastport close-up via Street View and started a habit of making screen shots when I saw a view I really liked! 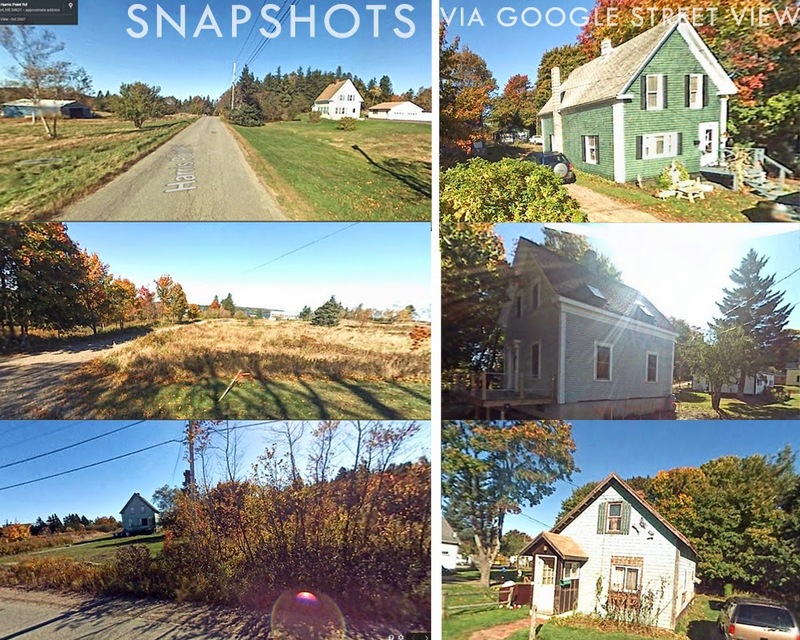 Taking screen shots like snapshots as I virtually walked the streets of Eastport. 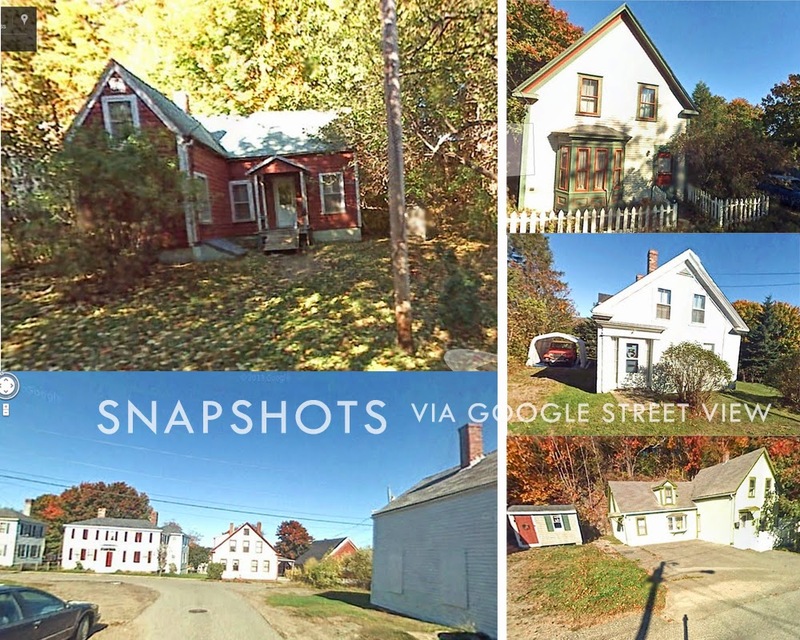 I picked out a few houses I liked...noticing a definite Maine [Eastport] vernacular. I didn't realize how many I took! It's just such a beautiful place, lovely time of year. Sometimes, the building I'd drawn in my pencil Draft was not in the right spot, or too large to accommodate the new buildings I was finding and drawing. 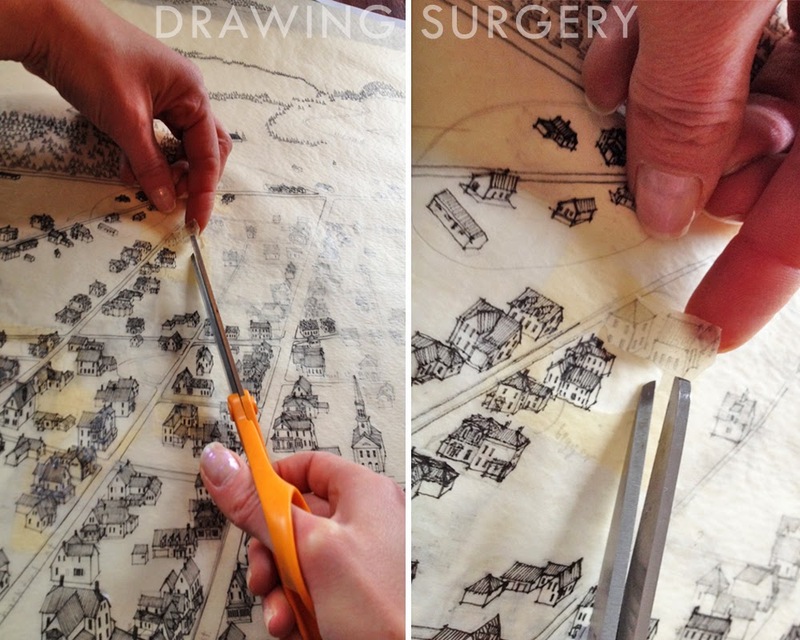 So, I came in with my scissors or x-acto knife for drawing surgery - a trick I learned at Sottile & Sottile. 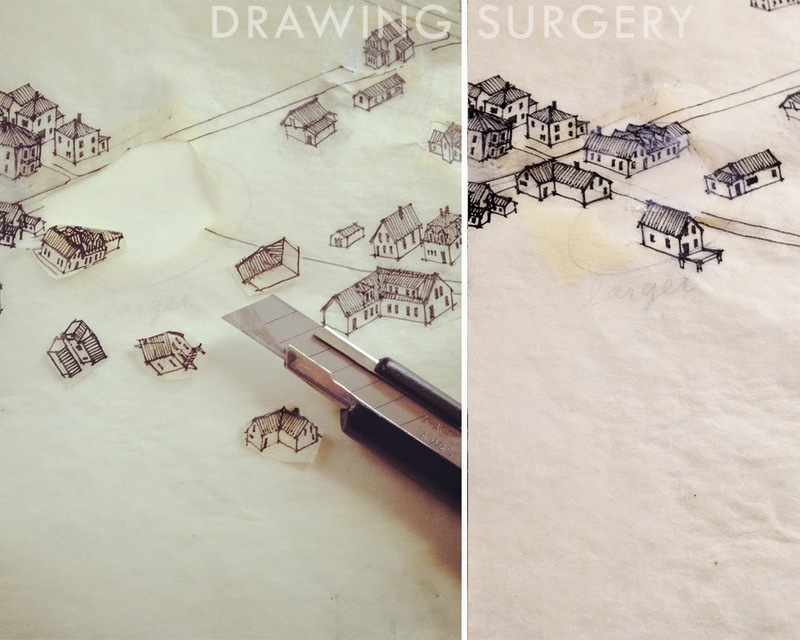 I cut out the mistake, tape a clean piece of paper beneath the hole and re-draw the building. More than occasionally, I realized the scale was off. The buildings I'd just drawn were too small or too large. This is more art than science. I ended up with many tiny off-scale buildings floating around my drawing table. They are still turning up between the floor boards. 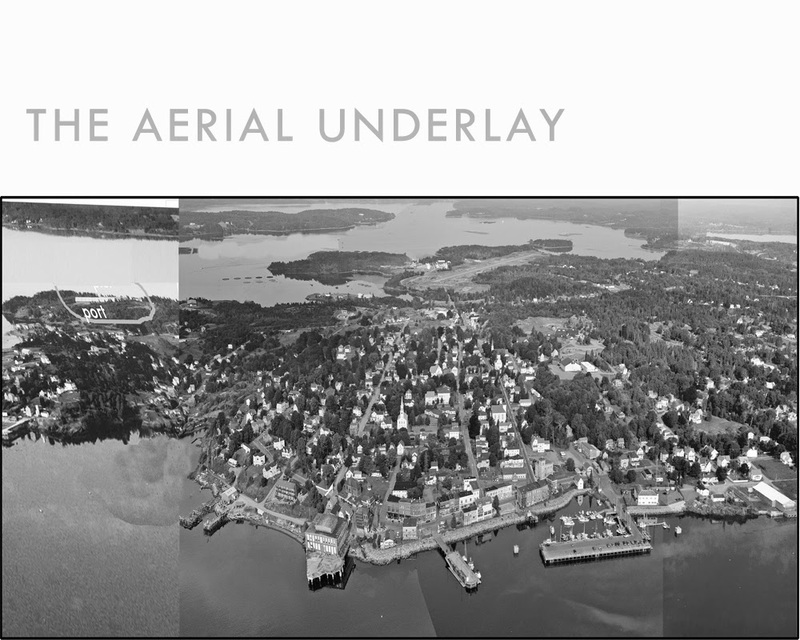 The South End of Moose Island, just beyond the central core of Eastport was totally obscured in the composite aerial underlay. So, this neighborhood was drawn fresh from the digital images. A little under half of the buildings in the town core were visible in the underlay. In pen, I added a little more detail, as well as drew their neighboring buildings. 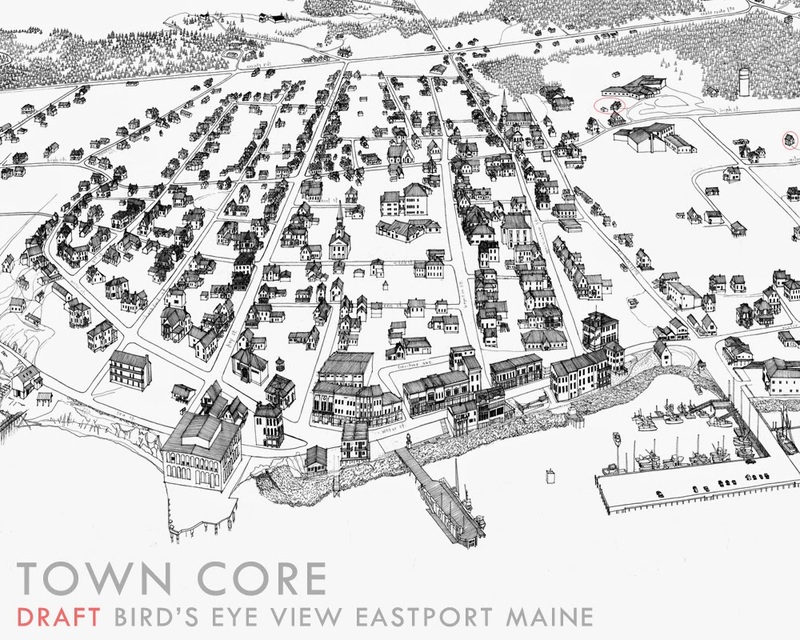 The town core is the center of the drawing, with the Tides Institute & Museum of Art (just left of my finger) and the facades of Water Street prominently visible. 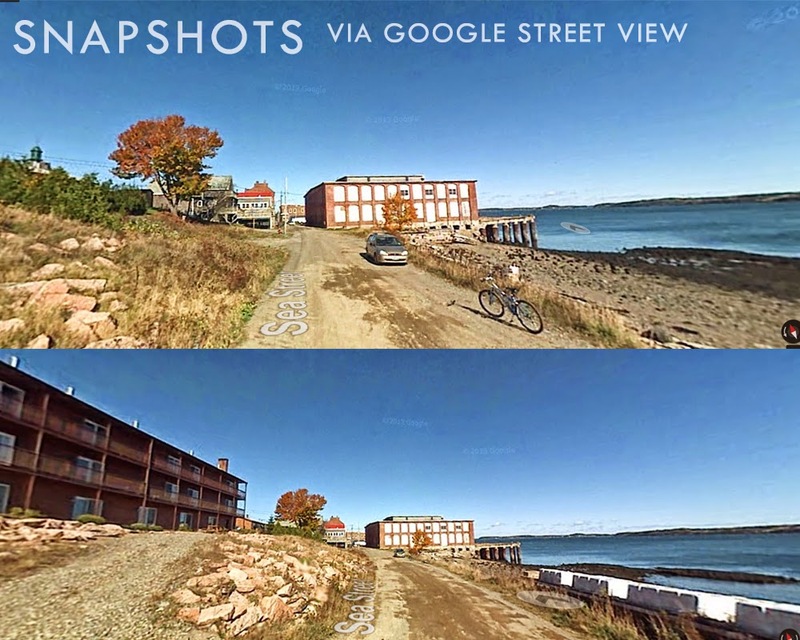 The receding view makes the land beyond Eastport appear completely forested. Drawing trees was sometimes a relief from drawing buildings in perspective. Until the end....when I had over 600 to draw. 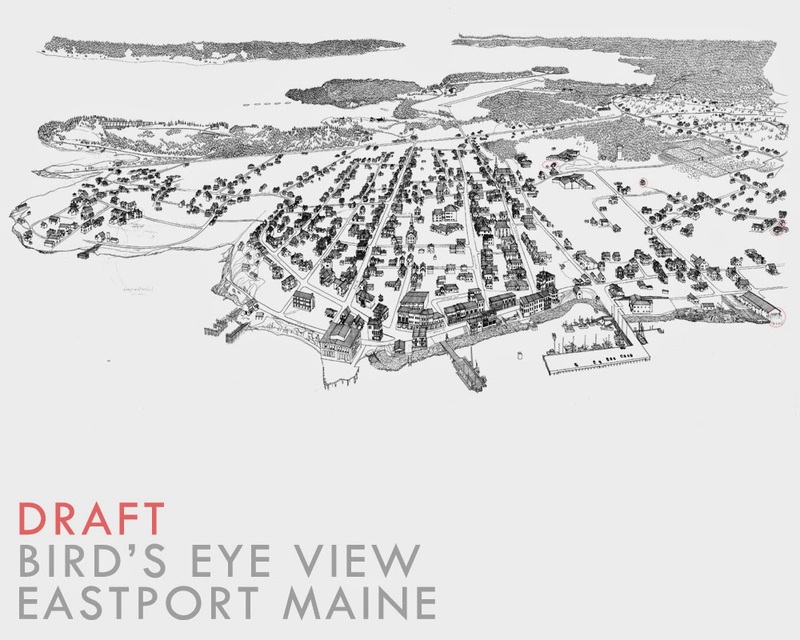 The northern portion of Eastport was also sparsely seen in the underlay. In addition to many houses and trees, I drew the Hillside Cemetery. The new welcome center to be constructed and the pier extension were also included. 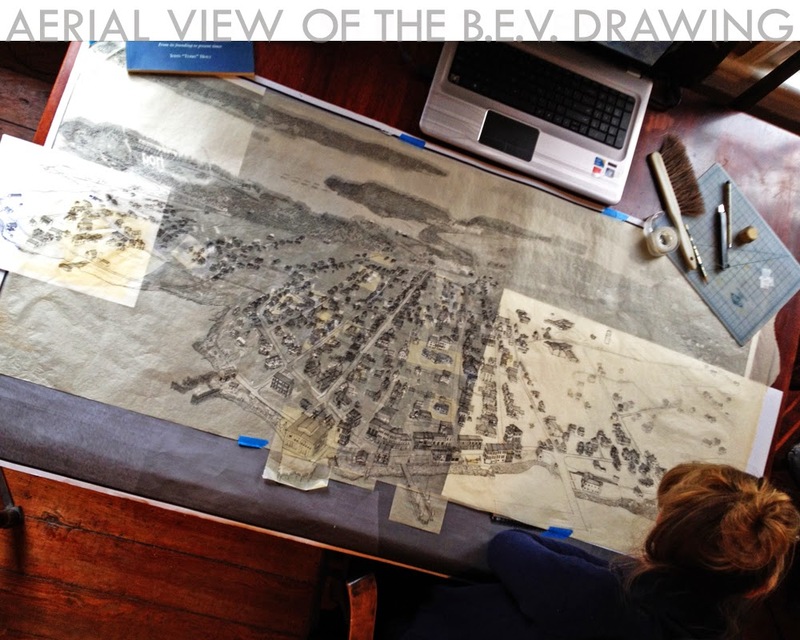 Finally, after two years, the delicate drawing on over thirty pieces of tracing paper and tape amounting to an area of 30" x 60", was scanned in a large roll scanner. This is a DRAFT. You'll see my pencil sketch lines still embedded. 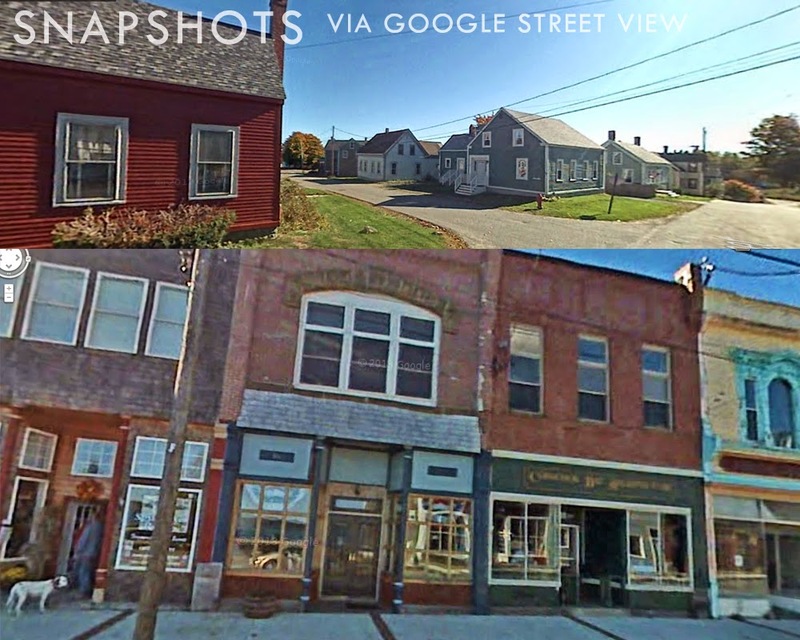 There are a few facades that still are not visible from the aerials or street views. 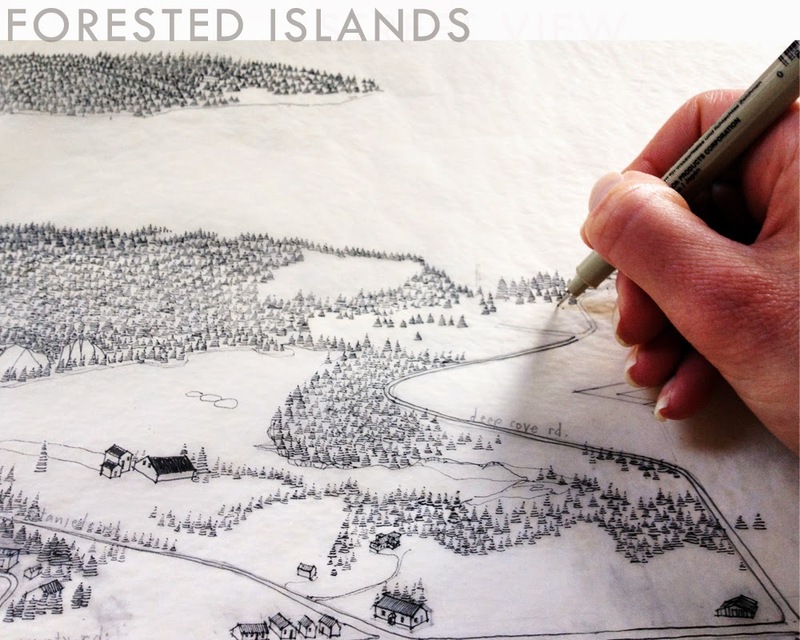 But it sure is neat to see the island town come to life in all those ink lines! 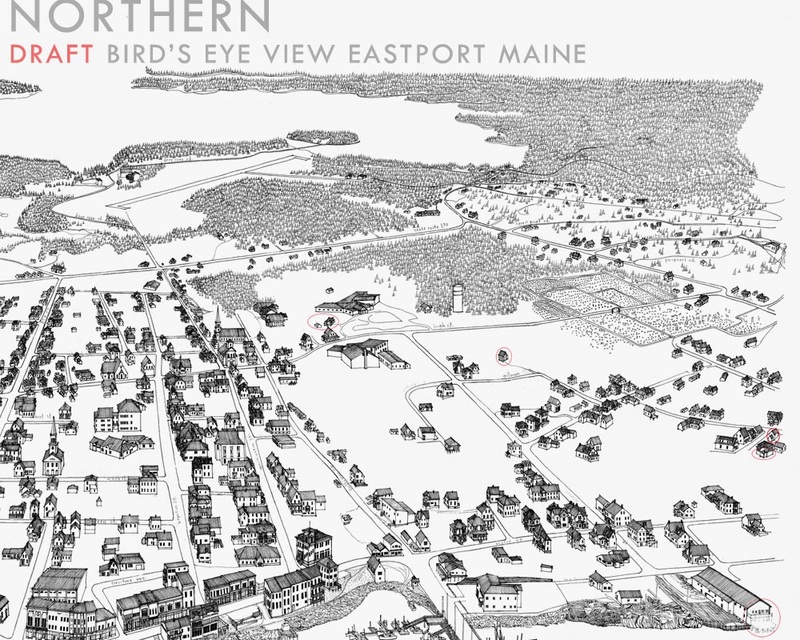 Here are some closer views of the three distinct areas within this Bird's-Eye View of Eastport. Everyone seems to agree: Bridge Day Staunton 2014 was pretty much perfect. Sunny and almost 70 degrees, a perfect weekend sandwiched between rainy weekdays. Donuts & organic produce (side by side), glitter tattooes and kid activities by Pufferbellies (the most fantastic toy store), Rogue Shakespeare, 3 bands and traditional English dancing men, ghost hunters and storytellers, community groups representing gardening, health, arts and craft, and a walking tour of Historic Sears Hill by Frank Strassler, Historic Staunton Foundation President, as well as many other events about town. Staunton was hoppin'! I missed out on many of these but I got to meet so many interesting people! Apparently, my husband is becoming quite the iphone photographer with all the practice I give him. 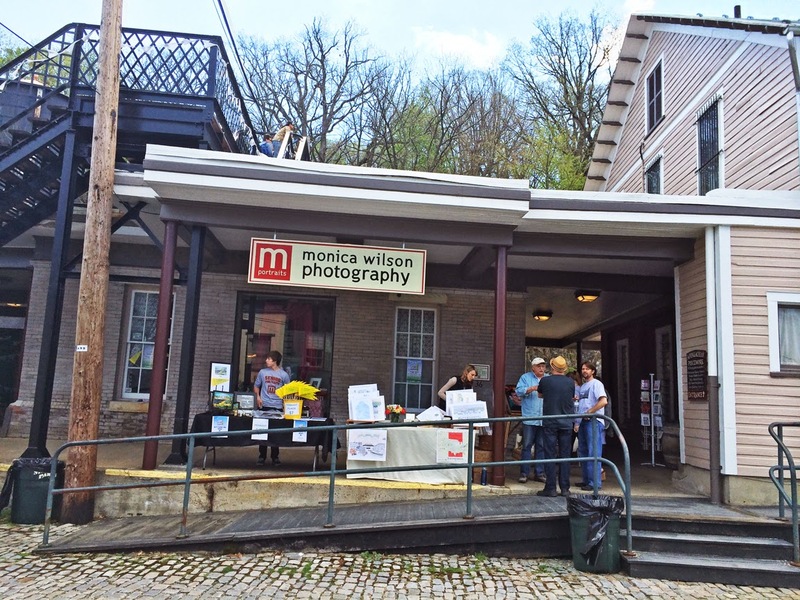 Here is my table and Monica Wilson Photography just outside her studio in the turn-of-the-century station's baggage room. The bridge ascends just over this spot and across the tracks to connect the depot area and downtown Staunton to the Sears Hill neighborhood. Thanks to Monica for this bulls-eye spot! I'm setting up just about opening time, after some great conversations with earlybird visitors over the community drumming group ramping up their rhythm at the stage area just to the left of the baggage room. My new Bridge Drawing/Print hangs frontward, as well as my Map of Places Drawn, thusfar. 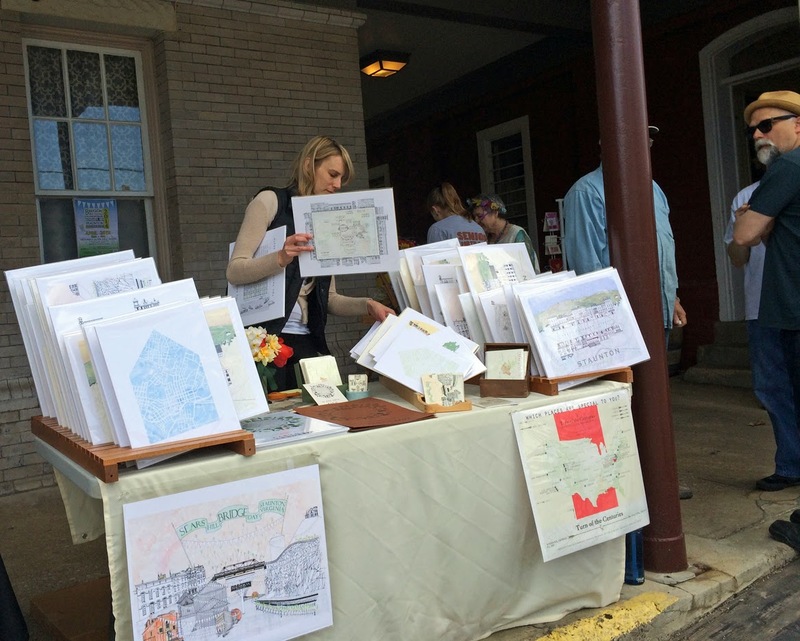 I'm selling mostly Staunton drawings today with a little of other places thrown in. I enjoyed hearing The No Lonesome play but did not get to watch them as the wind took an upturn and I was busy holding down my fort - but here is Peter Aaslestad, the band's guitarist, (also talented photographer, architect, preservationist, host of our joint Holiday Pop-Up Shop a few months ago) looking the part. 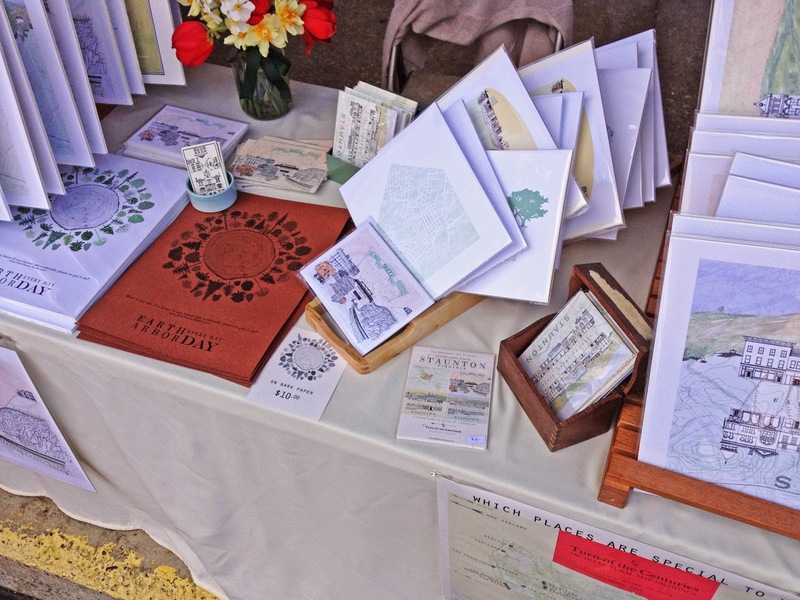 A quick shot of my table before the crowds. Home-grown flowers by my friend Alison and a little bowl I repurposed for the occasion as a business card holder by my friend Shelley of vitrifiedstudio.com. The winner of Pufferbellies' giveaway came to claim her Bridge Print! And I am soooo excited for her! Lisa of Artful Gifts was my neighbor to my left so I got to watch her explain how she created this Frida portrait with wool. Wow! She and her husband recently moved to town from Highland Co. to grow her business. She does AMAZING things with wool - including parts of her outfit! 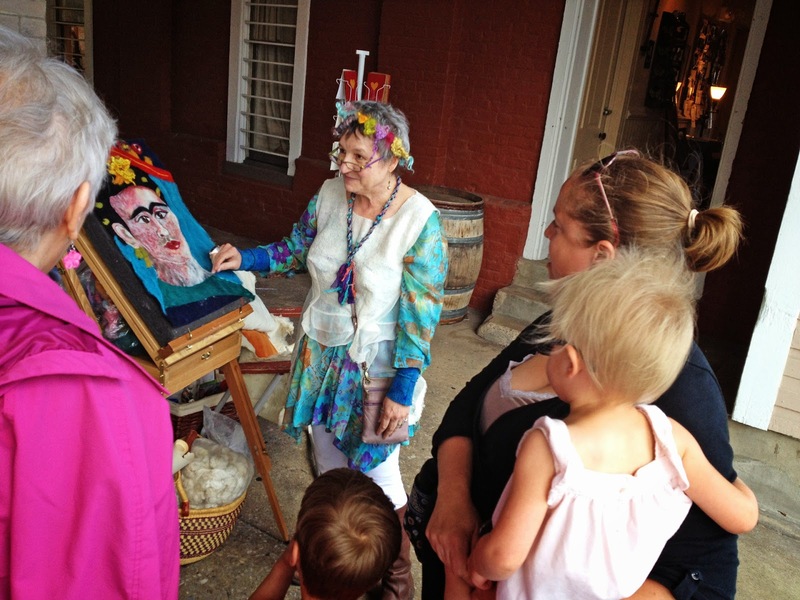 It was great to meet her and wonderful her shop is now at home in Staunton - at 6 Byers Street on the wharf. I may have been glued to my table but my joking with a man from New Orleans - who said he drove here yesterday and was headed back today - brought me a donut from The Baker's Dozen truck. Thanks New Orleans man! I'm finishing it off while watching our friend's daughter on the jungle gym in front of my table. 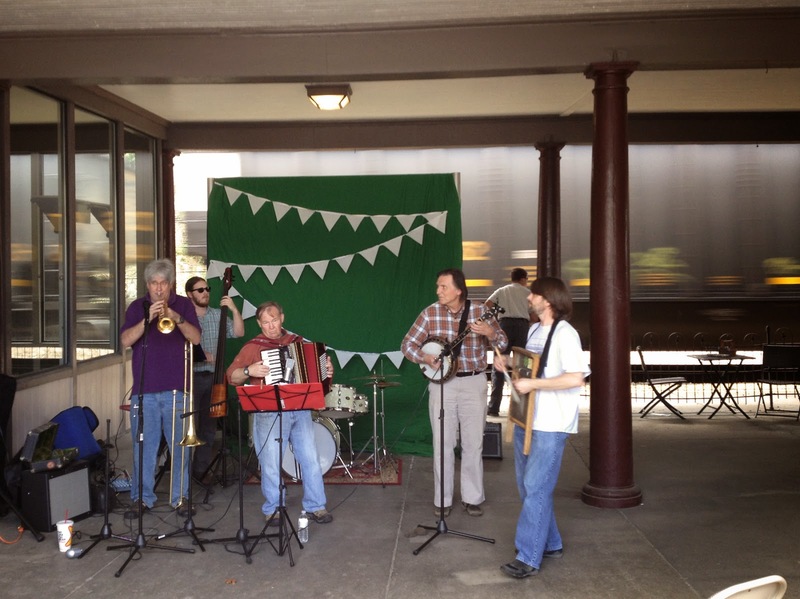 The Washboard Wonders on the Bridge Day Stage (love the bunting!) with the train whizzing by in the background. Seems just right. 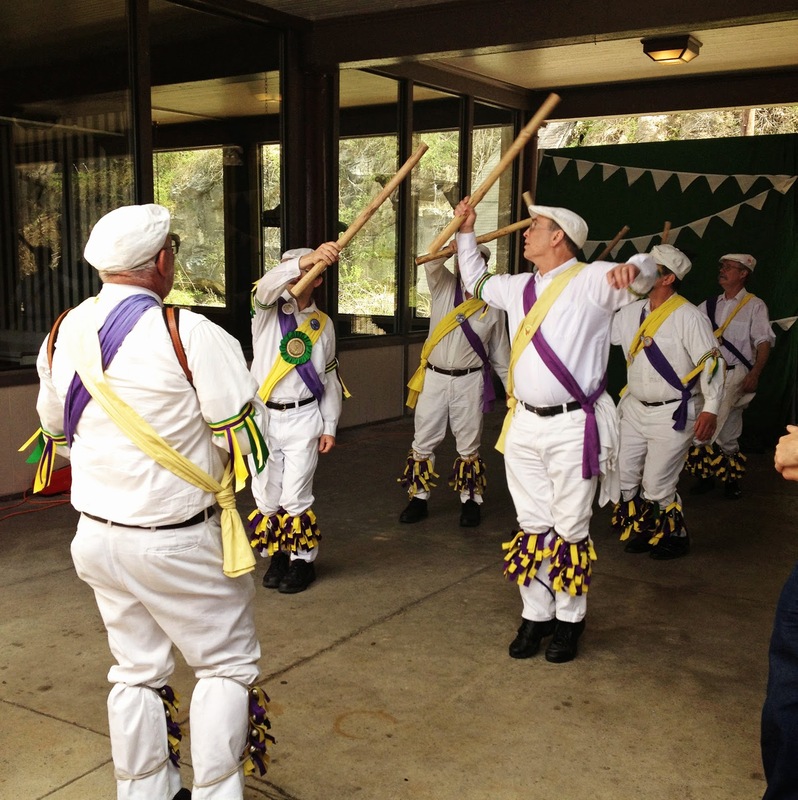 The Albemarle Morris Men, traditional English folk dancing group in a dance celebrating the ancient rhythms of agriculture. As we finally packed up around 5pm, we ran up to the Bridge to catch a selfie on Bridge Day. Thanks to my husband for capturing most of these photos and this little video! I smile to see people I know and people I met at Bridge Day in this collection. I guess we are starting to feel like we know Staunton a bit more and always grateful to be a part of this "fiercely independent" creative community of good people. a father who moved his family here when they could work remotely - and just bought a house! the wharf resident whose flat sounds like a gallery of art featuring his building and had tales to tell of movie filmings just outside his front door - glad my bridge drawing will join that gallery! 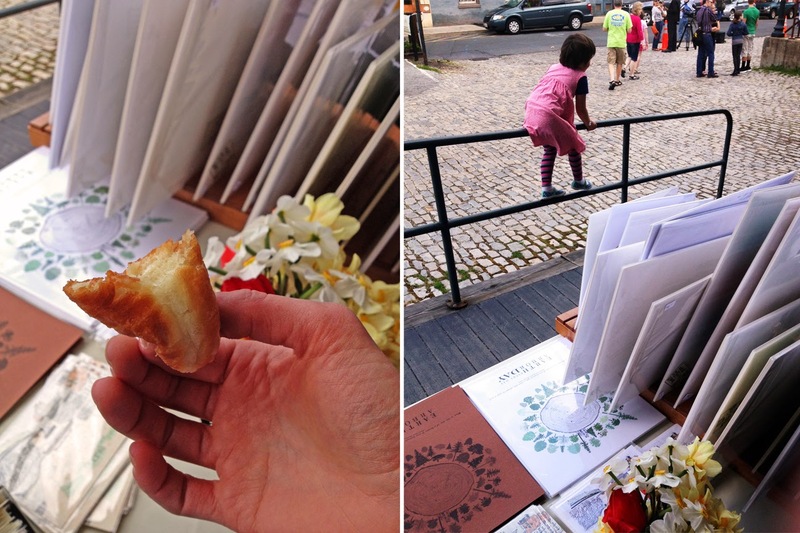 My favorite part of selling at Bridge Day was meeting the variety of interesting, talented, motivated, good-natured people who decided to make Staunton home. It's Bridge Day in Staunton Virginia! And I'll be selling this NEW DRAWING, among other Prints and Postcards. It's a gorgeous day - I am super anxious - but I am happy to have finally brought this drawing to fruition. Monday April 21: I figured the BRIDGE would be the best place to start! Then, I had so much fun rendering the rocky cut that allowed the tracks. i may have embellished the angularity of the rock just a bit! And, of course, the old water tower. I drew the quintessential STAUNTON station sign. Tuesday afternoon I visited with Kay Shirey of Rachel's Quilts, a neat, colorful shop and workshop in the Depot. She had just finished hanging the last of the white bunting that signals BRIDGE DAY! She'd marked the spots from last year - impressive - so it's hung just the same. 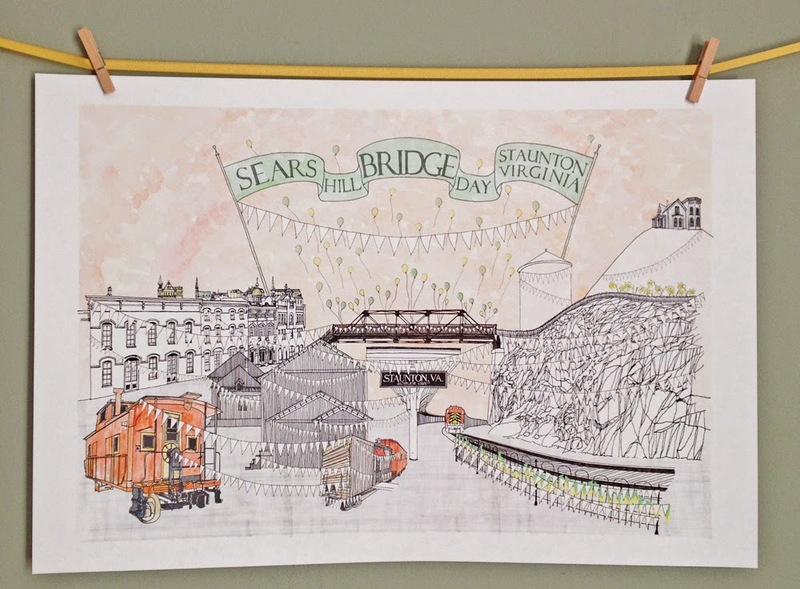 I gushed about how much I loved the bunting last year - I used it in my other Staunton drawings. 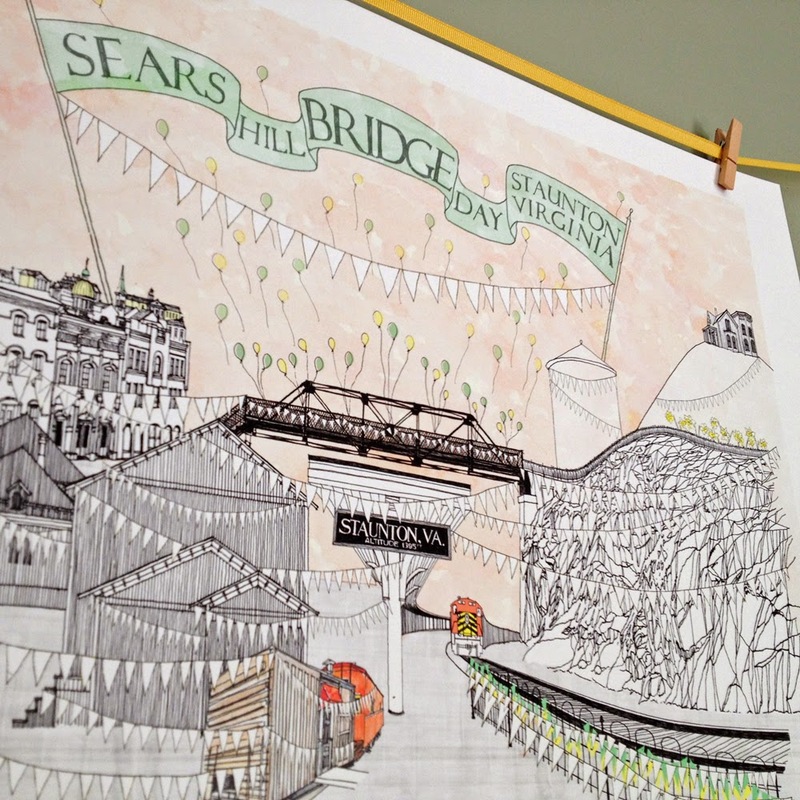 So, the bunting started to go up in my drawing - with a little artistic embellishment in Bridge Day colors. The Sears House too on top of Sears Hill! 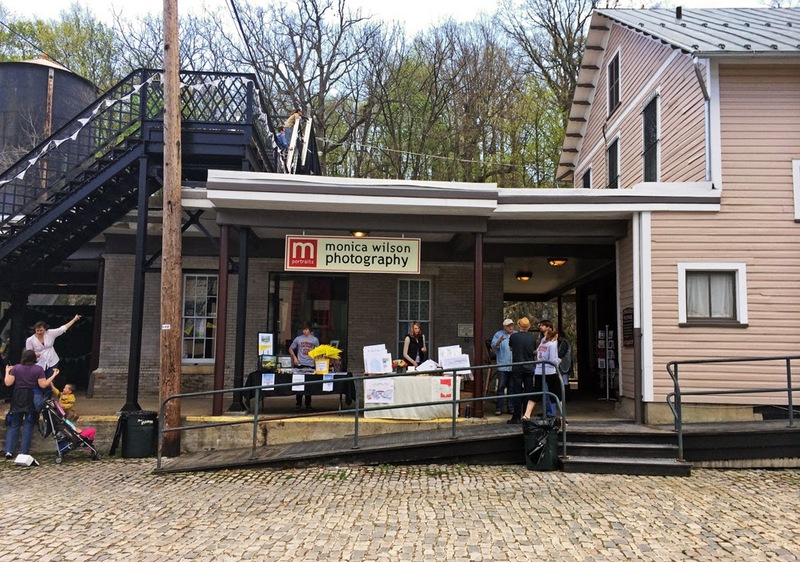 Wednesday April 23: The Depot is an amazing building in all of its phases. It deserves a drawing all its own. To allow the Bridge to be the center star of this drawing, I rendered the depot in section. The portion of the wharf across from the Bridge landing and toward Augusta Street is another favorite view, with the tops of Staunton's architectural icons - Masonic, St Francis, Courthouse, Mary Baldwin popping up above their parapets. This was kind of hard to draw, and then to place it behind the depot in section. Friday April 25: Putting it all together, drawing the title banner, balloons and hours and shades of watercolor sky. 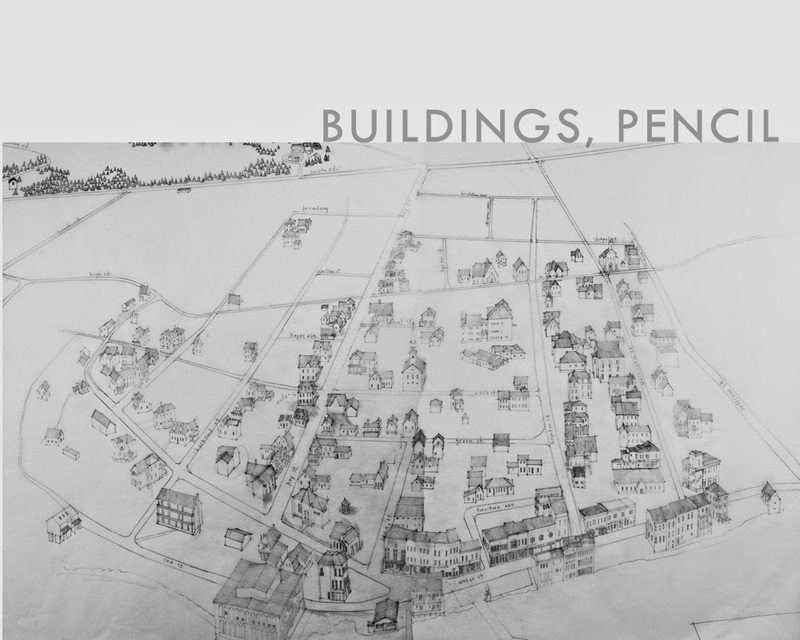 ARCHITECTURAL MAP-DRAWINGS art prints, postcards & books. Personal, Gift & Institutional Sales and Commissions. 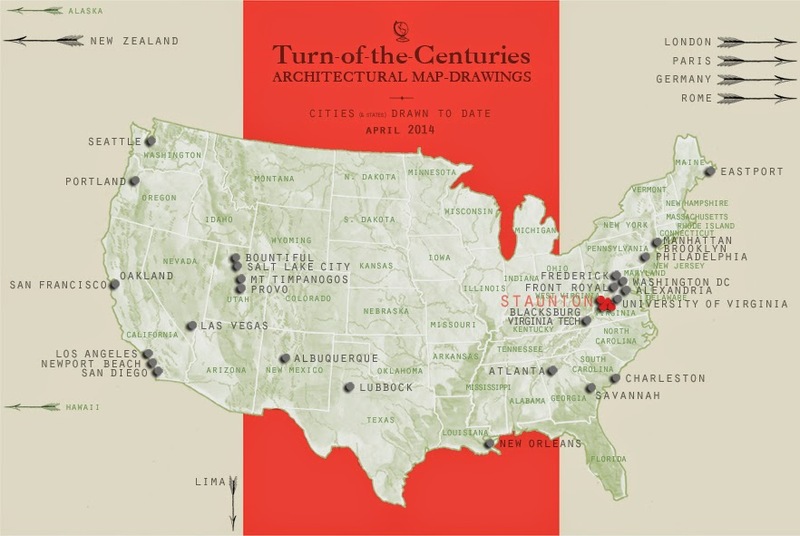 From the College of Architecture at Virginia Tech to Savannah GA to Washington DC to the School of Architecture at the University of Virginia to historic Staunton, I have lived where I could draw - and traveled to interesting places to draw. 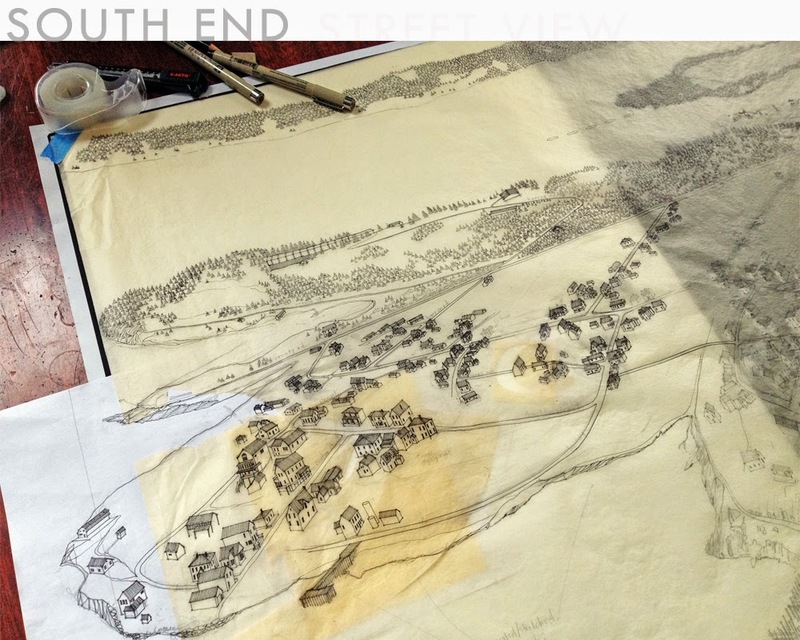 I make Architectural Map-Drawings, combining plans, elevations and perspectives to illustrate dynamic spatial relationships and memories within historic places. 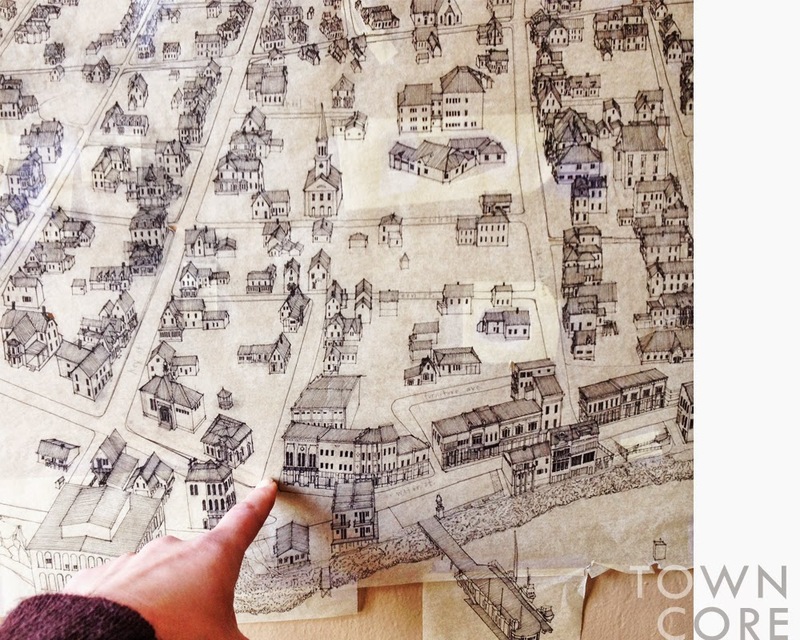 This is an archive of my progress and a forum for images and ideas - mine, yours - about maps, drawings, architecture, urban design, historic places, education and travel. BALTIMORE MD: Gay Street, Fells Point, Abell Ave.